I had such a great time with Jennifer and Dylan! We explored RiNo and checked out the vibrant and vivid artwork that is around every corner. If you explore Larimer, you will find there really isn’t a bad spot to take photos. It’s just so colorful and full of life! I’m really getting to know RiNo, and on top of the colors, the food, drinks, and shopping are such a delight. It feels like a treat every time I am in the area. And of course, it’s an extra special treat when I’m exploring with a loving couple and taking pictures with them. Jennifer and Dylan met at work. The place they worked had a happy hour whenever a new person was hired, and one particular summer, there was a lot of growth at their company. Because of this, they found themselves enjoying many a happy hour with each other and the rest of the team. Eventually they’d find themselves staying longer and longer and making excuses to hang out with each other long after their coworkers had gone. Soon they didn’t need the excuse of a company-led happy hour to spend time together. 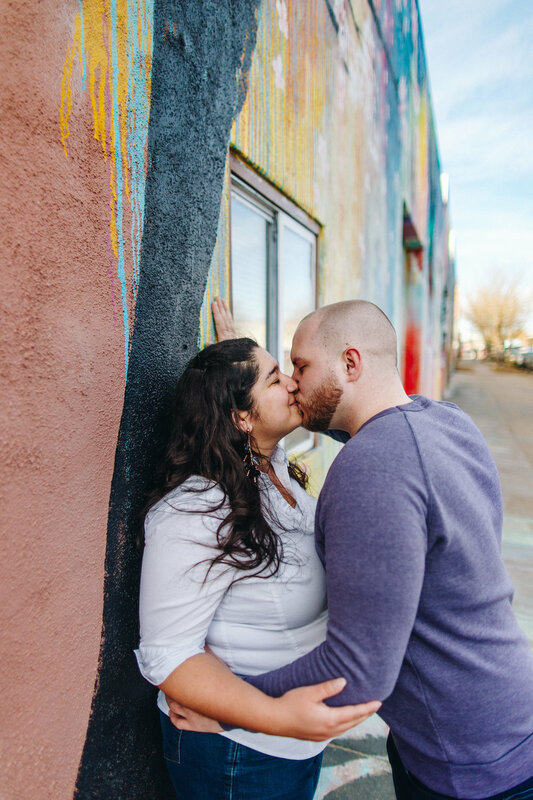 And of course, the rest is history, because here we are in present day doing an engagement photo session with a wedding right around the corner! Jennifer and Dylan, I had so much fun with you both! Thanks for exploring RiNo and for sharing your fantabulous (fantastic and fabulous) love for the camera. I can’t wait to photograph your wedding in May!